Giancarlo Stanton faces his former teammates when the Marlins visit Yankee Stadium. The slugger led the majors with 59 home runs and was the NL MVP last year, then was traded to New York. Stanton is hitting .220 with three homers for the Yankees, striking out 25 times in 59 at-bats. Caleb Smith starts for Miami – he pitched for the Yanks last year, and was sent to the Marlins in a separate deal. Marlins CEO and former Yankees star Derek Jeter will not be attending the two-game series in the Bronx. ”I went to a spring training game when we played New York, but it would be an awkward situation for me to actually go to Yankee Stadium,” he said last week. 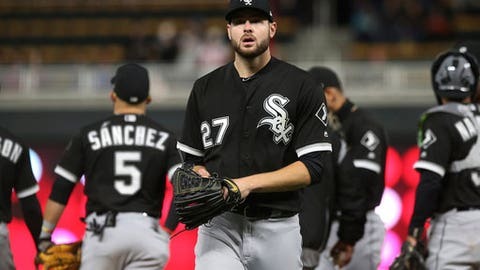 The Chicago White Sox begin a series at Oakland, where the gametime temperature for the opener is supposed to be in the low 50s. That’s still a lot better than what they left behind in Minnesota, where a blizzard helped wipe out the last three games of their series at Target Field. Six games were called off in the majors Sunday, increasing baseball’s total number of postponements to 21 just 2 1/2 weeks into the season. It’s the highest number through the end of April since there were 26 in 2007, and there are still a couple weeks to go this month. Adam Wainwright (0-2, 5.06) starts when the Cardinals take a four-game winning streak into their first matchup of the season against the NL Central rival Cubs. Jon Lester (1-0, 4.40) is set to pitch for Chicago at chilly Wrigley Field. Two talented left-handers will be looking for their first win of the season when the World Series champion Astros visit Seattle in the opener of a four-game series between AL West rivals. Dallas Keuchel (0-2), the 2015 AL Cy Young Award winner, gets the ball for Houston opposite James Paxton (0-1), who matched a career high with 10 strikeouts in his last start at Kansas City. Jeremy Hellickson makes his Washington debut against Mets ace Jacob deGrom (2-0) in the series opener at Citi Field, with the Nationals looking to avenge a three-game sweep by New York earlier this month. Bryce Harper and the Nats were heavy favorites to win the NL East again this season but they’re already six games behind the surprising Mets, off to the top start in team history at an NL-best 12-2.